Well it has been a while sense I posted the main reason I have been away is I got a new toy, the new toy is an Arduino. What is an Arduino you might ask? Well a Arduino is a small micro-controller that can be used to control things from little lights to robots. 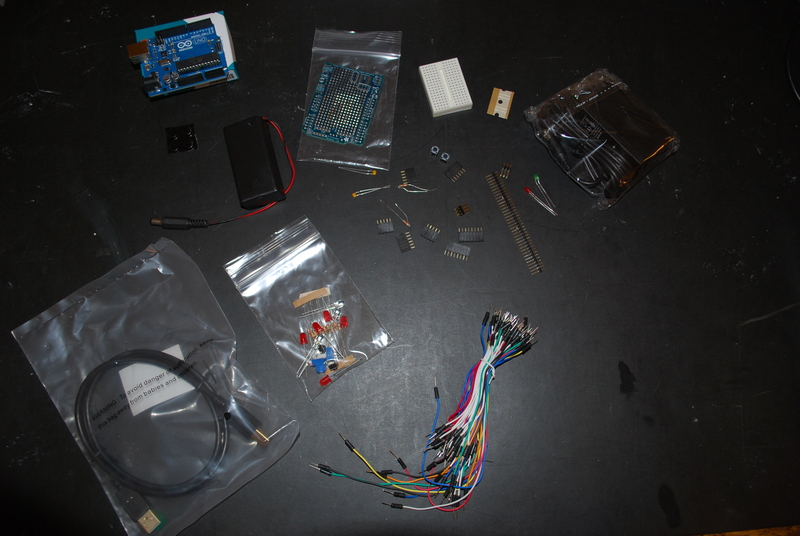 Everything that comes with the Arduino R3 Kit. As you can see there was a lot of stuff that came with it I will do my best to remember the names of everything. Starting from the top Left it is listed below. Well I finally pushed the new site live today. This site will go over some changes in the next few weeks to get a better feel and look that I want it to be and in time create my own theme. The site will be my own thoughts and projects and other things I wish to share with the world as well as stuff I might create or want to sell. Please post comments on anything as I start to post information up and get things going. I am going to be having a section dedicated to how my site use to look and the different sites I have created in the past and moving forward. I hope that everyone who visits the site will be able to get some use out of it and something from it. New site with a new look! Well this is new for me I have finally had time to get this site up and running decent and working on getting everything completed and running. The new format for the site is going to be more of a personal blog with updates from my life and what is going on with a goal to update with a post once a week with what has gone on and going on and different projects I have.